10/13/2008 - Healthcare System Solutions recently attended the SECAPS (Southeastern College of Anticoagulation Providers) conference in Franklin, TN on October 10-11th, 2008. 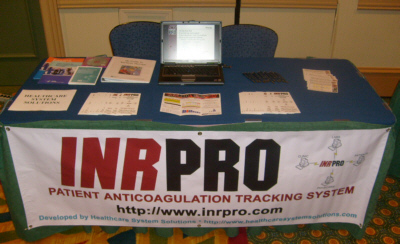 We met a lot of great people with clinics that could greatly benefit from our INR Pro product! The following are some highlights from the conference presenters, related to INR Pro. PST is effective, but only for the right type of patient. Only about 10-30% of your population will fit the criteria. Your clinic should have a process to evaluate patients that want to perform self-testing. Time in Range % can also be calculated using expanded ranges (beyond the given limits). For example, an expanded value of 0.2 would mean that a patient with a 2-3 range would be considered "in-range" if their INR value was actually between 1.8 and 3.2. Wurster stated that 0.3 is commonly used, and 0.2 is used as default in most software programs. However, he recommends not applying any expanded range, since complications with INR values can happen close to limits. INR Pro allows you to select any expanded range value, but defaults to 0.0. Use an electronic data system to manage your patients (like INR Pro!). He says it is too difficult to keep track of everyone otherwise. Treat the self-testing patients like any other patient. In other words, schedule them like you normally would, as if they were coming into the clinic or lab for a blood test. This makes it easier to track the patient, so they don't get forgotten about. INR Pro does not distinguish a difference in processing between patients using self-testing, and those coming into a lab or clinic for testing, but does track it in the system. In addition, INR Pro allows patients performing self-testing at home to login from their home computer and submit results directly into the clinic system. They can also call into the clinic, and the adminstrator can add their results to the system, if they don't have internet access. Their results will then show up in the system as a patient that needs to be contacted. National Patient Safety Goals for Anticoagulation: Are You Ready? 2008 requirement (#3E) within JCAHO's National Patient Safety Goals: Reduce the likelihood of patient harm associated with the use of anticoagulation therapy. This only applies to therapeutic anticoagulation management for out-patients, not in-patients. As of October 1, 2008, the expectation states that pilot testing in at least one clinical unit should be under way (INR Pro can help address the following implementation expectations: A1, C4, A5, C9, C10, A11). 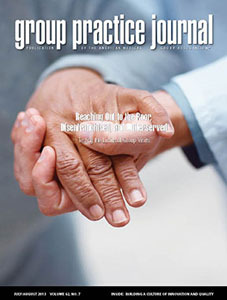 As of January 1, 2009, all clinics should be compliant to the goals. According to Gulseth, this means clinics must evaluate their anticoagulation safety practices, show continuous improvement actions, and measure effectiveness of actions on a regular basis. They should also define what baseline history of INR results entails, and what constitutes a current INR value (i.e. if more than 24 hours, then re-test). INR Pro can work with you to upload historical data to fulfill the baseline data requirements, and will provide the system to meet all of the continuous improvement requirements. 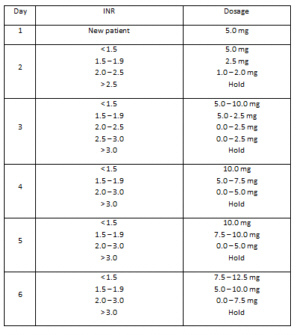 What is the correct protocol for dosing patients, based upon their most recent INR value? Gulseth stated that there is no correct answer yet. He highly recommends having dosing guidelines, not hard set rules to follow, since each patient is so different. INR Pro does not provide any recommended dose changes, because there is no established criteria that has been proven, and we believe that historical data results for each patient should be reviewed, prior to making any dose change, which is not factored into any current guidelines. The guidelines that are currently available are not geared towards in-patient settings, so he provided a set of guidelines for new patients that he feels works pretty well. As for quality metrics, he recommends all clinics monitor the number of patients with INR > 6 per month. INR Pro currently provides a Complications report that will display the number of patients with INR > 5 over a given time period. We are currently working on a way to modify that report, so the user can enter any max INR value to evaluate. He also recommends that clinics use FMEA (Failure Modes and Effects Analysis), a traditional Six Sigma tool used to prevent errors from occurring. Healthcare System Solutions can provide training and facilitation for any clinic wanting to perform an FMEA on their current or newly created processes.